Director Singing Chen graduated from the Advertising division of Department of Mass Communications of Fu Jen Catholic University. During her college years, she practiced film-making in Huang Ming-chuan’s studio specializing in documentaries. Extended training in the field of independent film-making has consolidated her experience in shooting and production. 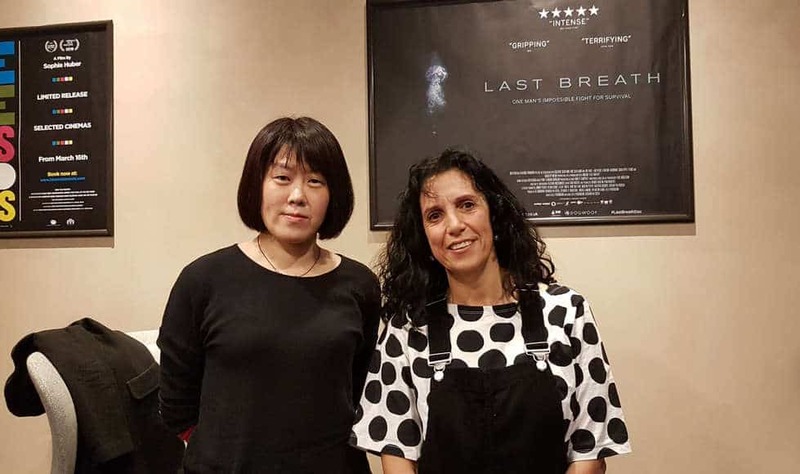 On the occasion of the screening of “The Walkers”, “God, Man, Dog” and “The Pig” at the Taiwan Film Festival UK, we talked with her about spending 10 years with the Legend Lin Dance Theatre, being invisible, a truckful of abandoned Gods and many more topics. Can you tell us about your first encounter with the work of Lin Lee-chen and what sparked in you to make you stick with her for 10 years? In 2004, Lin was awarded Best Artist of the Year by the Taiwan Art Council so I was invited to film a 20 minute contribute for her winning this award. Being a commission work, they had scheduled 1 month of filming only, but then, when I finished, I felt I had this very special energy and I felt I wanted to film more. In 2000, I had a chance to see for the first time the Legend Li Dance Theatre performing “Anthem to the Fading Flowers” at the National Theatre in Taipei. The dancers in her shows always move very slowly and the transitions are seamless and I had a feeling very close to experiencing the universe, as you don’t see sudden changes but only a unity, slowly transforming. And at the end of that piece, the dancers chant the Heart Sutra and when that happened, I don’t know why, but I started crying. That was 2000, then in 2004 I had that month shooting for the Award contribution and after that I wanted to know why I had cried in 2000, I wanted to know more and I started to follow the Legend Li Dance Theatre. The Legend Li Dance Theatre looks very different from a regular dance group; art, life and religion are inseparable. How did you manage to get so close and create this very intimate portrait? When I make a documentary, I make myself almost invisible so before I approach this idea of filming Lin Lee-chen, she requested to watch all my works as Lin is very careful about who can enter the group. She told me this story when the film was already in cinemas; at the beginning of my work, as on stage all the dancers have bare feet, when I arrived with the cameramen I noticed that and I took my shoes off and asked the cameramen to do the same before entering the stage, thinking that it was a respectful thing to do, and that thing apparently made me part of the group. After that action of respect, Lin thought she could trust my crew and me, as we had acted differently from the other filming crews before (being disrespectful). For her, that was something very special. There are many different techniques to make documentaries; for example if you want to show someone reading, even if you know that he will read in that room at that time, you can stage the whole thing and film it, this is one approach but I didn’t use that style. The reason why I spent so much time in the making is because I observed what was going on and when I needed a certain shot I knew that that was going to happen at a certain time and just wait and be there without asking Li to do anything. I spent so many years with them so if you pay attention you know where they are and what they do. The editing of 10 years of footage must have been a nightmare! (She laughs) Long story! I have been editing this film for 3 years. The first year I went through all the rushes. I couldn’t really edit, just watch all the rushes and often thinking: “Oh, I forgot to film this!” or “I didn’t catch that!” and only in the second year I got to actually sit down and do the editing. I started to assemble all the rushes into sequences. Roughly I put together more that 60 sequences, a very slow process and then in all these sequences I started to add chapters and titles, for example “The Bride” or “Who Am I?” so I started to come out with some concepts and group them. I had two editing lines, one linear structure of the trilogy of Legend Li pieces they performed in the years (“Mirrors of Life”, “Anthem to the Fading Flowers” and “Song of Pensive Beholding”), and another line with the concepts. So, one vertical and one horizontal? Yes, the linear structure of the Shows is more invisible, and the other more evident and they intertwine. Then, once I pieced everything together, I discovered that the stories of these titles illustrate a life of a woman, starting with “The Eyes” of the woman, then the textile for “The bride” and then “Mother” and then “Who am I”? So it became a journey of being a woman in culture. Where do you think this energy and determination that Lin has may come from? In the second piece, “Anthem to the Fading Flowers”, she starts from spring and then summer and then autumn and winter and because she was inspired by the rocks with souls, she was trying to say that spring is not a beginning and winter is not an end, but it is a rolling routine, a cycle. The final piece “Song of Pensive Beholding” was inspired by the view in her hometown of an eagle diving down to catch a fish, but when it reached it, the fish was already dead because of the pollution and that sparked a reflection about our territory and what we do to it. Looking at the years, “The Walkers” must have overlapped with “God Man Dog”. Did they influence each other? And in what way? When I finished my film “Bundled”, I got depression and I couldn’t do anything, I didn’t have any energy to create new work even though I was trying to write screenplays, until I met Lin Lee-chen. Because she has this energy and she is, like, if you want to create something just do it, there is nothing stopping you, and that really inspired me. I felt as if I had been charged, I met her in 2004 when I started filming “The Walkers” and in 2005 I completed the screenplay of “God Man Dog” and so in 2006 I started the film. The documentary took a long time but I think it is very coherent, as the dancers’ movements are very slow and the way I developed is also very slow and that allowed me to be close when the things happened but also to have time to make my own feature. The way I make documentaries is not like the other documentary directors, they have schedules and a plan and they know it needed to be completed at a certain time. That is not my style; the way I approach documentary is more like searching for something, searching for answers to the questions I may have from life. So I didn’t really plan to spend 10 years on this film but I just thought, when I have all the rushes and I think I have got something there, then I will stop. Can you tell us something about your perception of religion and spirituality in your feature film “God Man Dog”? It took me 5 years to write “God Man Dog”. What triggered me to write it was that when I was in the second year of University, my younger brother passed away. In East Asia, especially Taiwan, when someone of your family dies, religion believes and faith get involved very strongly and there were so many forms of religion and so many forms of ritual but none of them could help me or my family to overcome that tragedy, and so I started to question religion, and ask myself what religion if, what belief is and what these ceremonies are. In “God Man Dog” the character Yellow Bull, even though it looks like he has nothing, he has a whole truck full of Gods that people has abandoned and that symbolises my view of religion. Can you talk about the “Taipei Factory” project and this collaboration with Korean director Jero Yun for the realisation of the segment “The Pig”? That was actually a commission, a joint film project of Taipei Film Commission and Directors’ Fortnight of Cannes Film Festival, pairing four Taiwanese directors with four foreign directors, but they managed to flight Jero over only one week before we started shooting. Did you know your partner before starting? No, we had to watch all their works and they didn’t know anything about Taiwan. The films had to be filmed in Taiwan so I started to suggest Jero all the things and places that could be filmed there and because all my films are about religion or folklore, often focused on lower social classes, and also we have in Taiwan this very special culture of pole dancers so we put all these things together and we started. We had talked before his arrival and, as his background is in art, he got in charge more of the look of the film, lights, atmosphere while I was taking care of other details. It is visually very strong! That wasn’t something that we decided upfront, but more a result of our journey, collaborating together and gradually growing towards that direction and making the film come together. And did you enjoy this collaboration? Did you have fun? I liked the final result. It is so difficult when two directors have to work together! But we found a way and we got along. The other three couples were constantly arguing! How is the situation of independent cinema and filmmakers in Taiwan? Is Chinese market a big looming presence? Years ago, the film industry in Taiwan was very small, we used to produce roughly from 5 to 10 films per year while now, after about 10/15 years, we have more than 70 films coming out per year and filmmakers in Taiwan are now trying to work on diverse stories and themes. So, although at the beginning the market was very small and it was difficult to make films, the directors found their own shape and style of storytelling. Therefore, even though the more commercial projects, may have Chinese investors, the independent filmmakers that suffered and survived those tough times, because of that they are stronger now, they have their own identity. And in the future are you planning to go back to feature films or carry on with documentaries? Have you got something in the pipeline now? Last year I completed another documentary called “The Moving Tent”, that was another long-term project, so after these two very long documentary projects now I really desire to make a feature film. I have developed the screenplay and I will start to shoot it very soon. Good luck from us then!